Manufacturer: Echo Diastasis - This is the retailer in Greece through whom the PH7 is being distributed at the moment. About two years ago I decided to upgrade my vinyl replay system, the turntable and arm are fine, a Garrard 401 in custom plinth with a Rega RB1000. The cartridge originally was a Dynavector Karat Ruby but that was worn out so was replaced with a low cost Denon DL103 while I found a better cartridge. 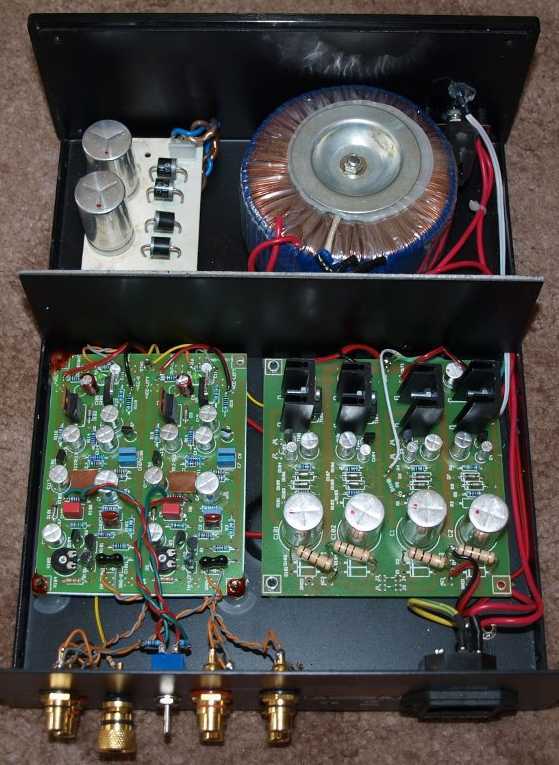 My phono amplifier was the classic EAR 834P, a very good amplifier but a bit noisy with low output moving coil cartridges plus it is difficult and expensive to replace the valves (tubes). I still own the 834P for the moment when I crave that valve sound but now use a Whest PS.30R, this was chosen partially due to the balanced output as well as the sound quality when compared to the 834P. 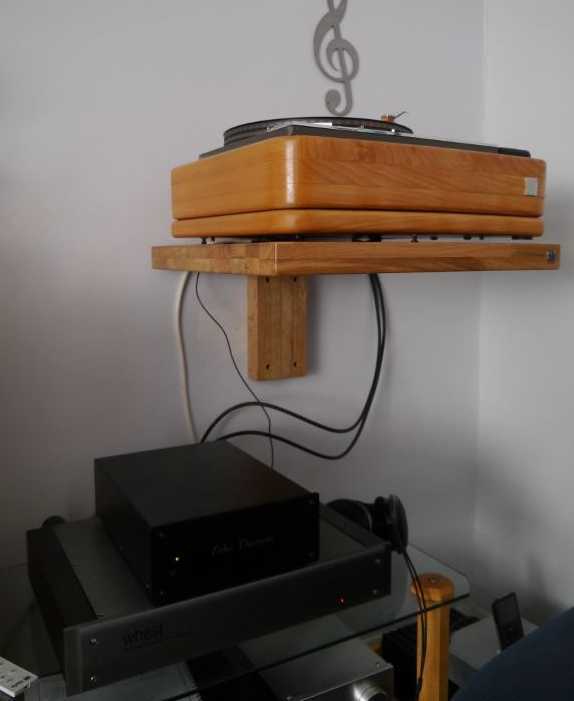 My turnable and phono amplifier are a distance from the rest of the equipment so balanced connection should be better. When I received the offer to review the PH-7 phono amplifier I thought it would be a good opportunity to validate my decision against another high end amplifier. This has proven a harder task than I imagined, the PH-7 only has unbalanced output so I was expecting more background noise and possibly some hum with the long (10m) interconnects but this was not the case, it is supremely quiet. The setup for cartridge matching on the PH-7 is very simple, there are an extra set of phono sockets next to the inputs into which you plug a suitable set of load plugs. I discussed my cartridges with Kostas from Echo Diastasis and he recommended a 100ohm load for both the Benz Micro Wood and Denon DL103. 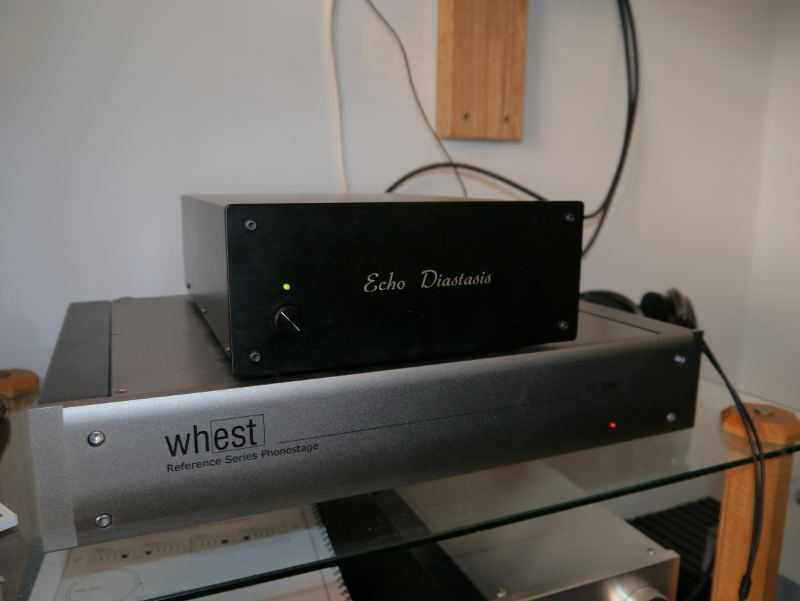 The Whest has both the load and gain set by switches accessible from underneath the amplifier so these were set to match the PH-7, they were almost the same any way so there was little difference and it made the comparison fair. To allow me to switch between phono amplifiers easily they were both setup on different pre-amplifier inputs so all that was required was to swap the phono leads from the turnable to the desired amplifier. My listening approach was to listen to one track or album side then swap to the other amplifier making notes as I went along, audio memory being notoriously poor! The first LP on the turntable is Michala Petri playing the William Babel Concerto in C and the Handel Concerto in B flat. Through th PH-7 the sound is a little sharp at times but then the Whest is similar and this is perhaps an artifact of it being an early (1983) digital recording from Philips. Comparing the two amplifiers the Whest appears a little faster although the PH-7 still has good rhythm and timing. The treble recorder and bassoon on the Handel Concerto opening movement andante allegro sound very rich and full bodied through the PH-7 as does the cello in the larghetto. Next up on the 401 is Ella Fitzgerald singing the Jerome Kern song Book, this is a Speakers Corner Records reissue on 180g virgin vinyl of the original Verve album. Ella's vocals seem a bit restrained but this is audible on both amplifiers though slightly less so through the PH-7. On the track "A fine Romance" the brass have a nice raspy edge through the Whest. The PH-7 has a little less obvious edge on the brass section whilst on the track "All the things you are" Ella's vocal is less gritty and better defined with a richer tone through the PH-7. I was rather curious that the PH-7 seemed to suppress the background noise more than the Whest, to investigate this further I dug out an old favorite of mine, Don McLean and American Pie. This pressing has always exhibited a pronounced background roar whatever turntable and arm/cartridge combination I used. Since I purchased the Benz Micro Wood the Don McLean album has sounded better with less of the roar but it was still there. Through the PH-7 the background noise was almost gone plus the clicks and pops of vinyl also seem better controlled, this is a significant improvement over the Whest. Working through side one of American Pie the PH-7 has nice clean bass with Don's vocals nicely centred in a good sound stage with a tambourine just to one side. The Whest was brighter sounding and the noise much more prominent, the vocals sounding thiner, with less body, not as natural sounding. Moving on to some classic popular jazz, Dave Brubeck and "Take Five" on a CBS double LP of "Time Out" and "Time Further Out". The Whest was up first showing this is a fantastic recording with wonderful drums and in particular the cymbals right there in front of you. The PH-7 gave a more relaxed and natural rendition, not as forward and in your face as the Whest. The PH-7 seemed to delivery a more believable sound with the double bass sounding cleaner and the notes easier to hear with a more obvious decay to the plucked strings. For me this album demonstrated the PH-7 in the best light and showed a clean pair of heals to the Whest. The final LP for this review is a Mobile Fidelity Sound Lab original master recording of Alison Krauss & Union Station Live. This is a bang update quality pressing on 180g vinyl cut from the original master tape. For some reason I have not been that impressed, perhaps the fact it is a live recording means the quality is not as good as some of the studio recordings from Alison Krauss. Through the PH-7 the sound is first rate, the best I have heard from this album. Compared with the Whest the sound is less forward, the sound stage spreads out behind the speakers where as the Whest projects more of the sound forward and in your face. It depends on personal preference but for me the in your face sound is exciting at first but for the long term the more laid back sound stage of the PH-7 is preferable. At this level you should expect some things to be done right and in both cases these are superb phono amplifiers, very quiet as well as solidly built. The perceived quality of the Whest is better, the build quality/fit/finish looks better plus it has balanced as well as regular unbalanced output. For me the PH-7 wins over with the lower levels of background noise from the vinyl and the more expansive sound stage back from the speakers. The differences between these fine amplifiers are small and to an extent personal, if you are looking for a new phono amplifier you should seek out the PH-7 it is a great sounding solid state amplifier. If I was starting again to upgrade the phono amplifier and money was not a barrier I would pick the PH-7 over the Whest on sound quality.